Pedestrians walk along the lake. At the end of December an era came quietly to an end in Los Angeles. 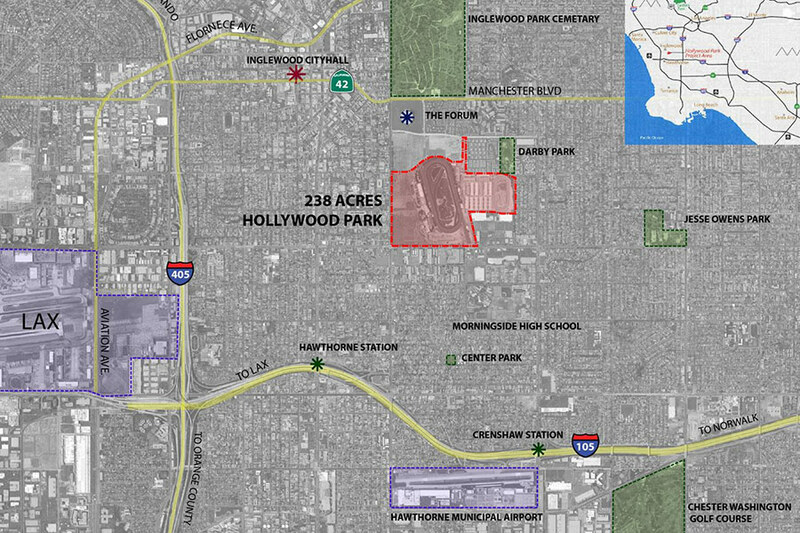 Inglewood’s Hollywood Park, once one of the premier racetracks in the United States—it hosted famous horses like Seabiscuit and Seattle Slew—held its last race, closing its doors after more than 70 years in operation. In its place is rising a 388-acre mixed-use community developed by Wilson Meany, the company that developed San Francisco’s Ferry Terminal, and master planned by Mia Lehrer + Associates, the firm overseeing much of the city’s big changes these days, from the transformation of the Los Angeles County Museum of Natural History to the revitalization of the Los Angeles River. The scheme, which was first envisioned in 2006 and put on hold in 2009 due to the economic downturn, broke ground last month. The heart of the new community will be housing, with 525 mixed-use residential units, 675 single-family homes, 1,500 townhomes, and 1,500 condominiums organized around curving, tree-lined streets. Design guidelines will likely call for modern homes and outdoor elements like roof gardens and terraces, a welcome change for this type of development. 6,000 new trees will be planted for the undertaking, in addition to some saved from the old racetrack. 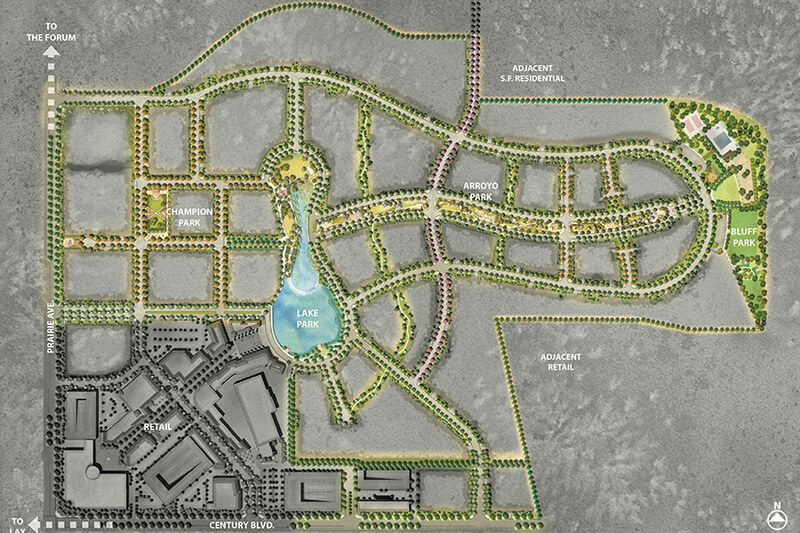 The development will also include a retail center, offices, a hotel, and a small casino. 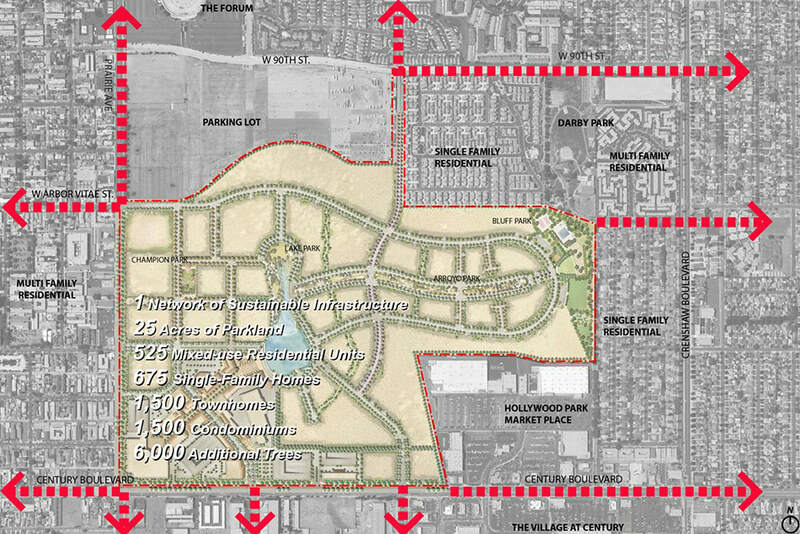 To create intimacy the team is dividing the development into neighborhoods, each centered around a park—open space is the other major piece of the project, with well over 25 acres around the site. These include the Arroyo Park, a meandering linear park designed with zigzagging walkways and vegetated swales to direct rainwater into the central lake; the Lake Park, centered, as its name suggests, around this large lake (a nod to Hollywood Park’s central lake); the Champion Park, for barbecues, picnics, and informal activity; and the bluff park, a private open space reserved for tennis, swimming, and other active uses. Besides aggressively inserting landscape and park space into the program, Mia Lehrer + Associates is pushing the developers on issues of sustainability and walkability. 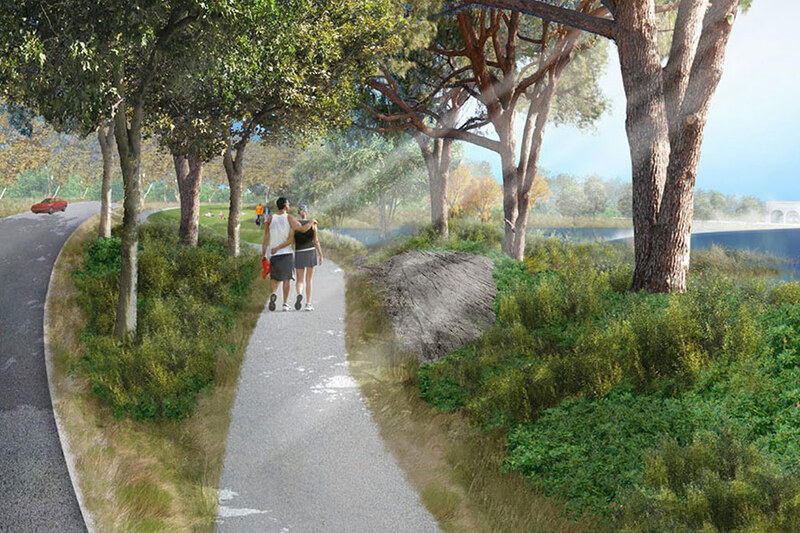 The site will be covered with walking and biking trails, and the team is currently hoping to change Inglewood’s general plan to get streets narrowed, and to add “bulb outs” along streets for more trees. Sustainable infrastructure includes water collection and purification systems and proximity to public transportation and schools. Other members of the design team include Hart Howerton Architects & Planners, BCV Architects, Quatro Design Group, SWA, JCJ and brand company Air Conditioned. 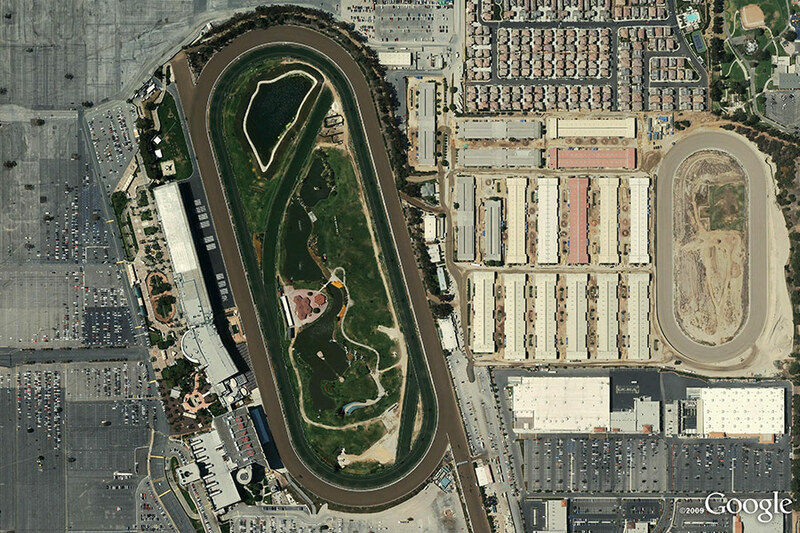 With the decline of horseracing, other U.S. tracks have been converted into housing in recent years. In Silicon Valley, San Mateo’s Bay Meadows track has been turned into an upscale housing development of the same name (also by Wilson Meany); and in New York, the Jamaica Race Track in Queens has been converted into the Rochdale Village housing development.